The Bajorans are a spiritual and mystical people who believe that all creatures have a "pagh," much like the human idea of a soul. Bajoran religion views the wormhole as the "celestial temple," and the aliens responsible for its construction, the "prophets." It is felt that only a strong Kai (a Bajoran spiritual leader) can unite the people of Bajor and allow it to become self-sufficient again. The Bajorans are an extremely religious people. Their basic society is centered around the Prophets, aliens who live in the stable wormhole near Bajor. 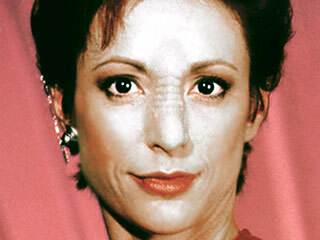 The Bajorans were enslaved by the Cardassian people and they resisted, driving the Cardassians off their planet. They now hold a deep hatred for the alien species. The Bajorans (Or Bajorns as they are known in the Kilb-iverse...) were a near human race enslaved by the Empire and put through horrible atrocities in then twenty-five years after the clone wars. It took the combined forces of Dragon Squadron, Free Squadron, Rogue Squadron and members of the Mutt Squad (Akiva Rostoni, Stromgald Caballa, Kryzah and the crew of the freedom.) to put an end to the Imperial presence in their sector of space. The Bajorns rebuilt their society with the help of the Republic and have since become part of the Galactic Senate with staunch feelings about slavery especially where it involves their own conflict with the Dassians (Cardassians), a race sided with the empire during the conflict and turned Bajor over to the Empire. They also have strong feelings about the Wookie / Trandoshan conflict, due largely to the Wookies help in their fight for freedom.